As many people have said since the phrase was first uttered, “you can't polish a t*rd”, so I'm not even going to try and bother to add a shine to the huge, nut-filled, steaming curler that this game was. 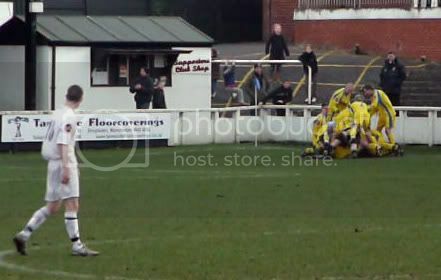 While Mossley's prospects of attaining a place in the top five may not be mathematically over just yet, this defeat, their third in five days, realistically brings to and end their slowly dwindling hopes of claiming a play-off spot. And it did so in a disappointing fashion. The strong and bitterly cold wind blowing across Seel Park meant that conditions were hardly conducive to passes above head height but that's precisely what happened; both sides in the main resorting to pinging the ball through the swirling air. As a consequence it spent more time flying out of the ground than launching any meaningful attacks and, unsurprisingly, it was the ball boys who ended up seeing more action than either of the goalkeepers over the course of the first half. It meant chances were at a premium and only on three occasions did the game threaten to burst into a modicum of life in the opening forty five minutes. The first moment arrived with the game barely two minutes old and fell the way of the visitors. A lack of communication between Mossley's two centre halves allowed Adam Farrell to advance on James Mann's goal but his attempt to lob the keeper ended disastrously with the ball bouncing a yard wide of the gaping goal. The two other opportunities fell the way of the Lilywhites with Danny's Toranczak and Egan both glancing headers narrowly wide of the uprights. As well as few shots from distance that didn't go anywhere close to troubling the score sheet that was as good as it got before the break and to be honest, there wasn't much improvement after it. What little there was though was down to the visitors beginning to show a touch more invention as an attacking force and their improved efforts were rewarded with a penalty eight minutes after the restart. As good as Chris Ward's spot kick was though, it wasn't as good as the save from James Mann that met it and kept the match at stalemate. James Mann makes the penalty save. Chorley continued to press forward but the lack of any kind of end product to their attacks meant that what few chances presented themselves were wasted. No greater evidence of this came when with two minutes of the match left, Sharrock was put clean through on goal but, with his moment of glory in front of him, all he could do was spoon an incredibly weak effort into Mann's arms. A minute into injury time though his blushes were spared when some lackadaisical marking allowed James Mullineux to rise unchallenged at a corner and head home a winner for the Magpies. A victory that despite the poor quality of the game no one from Mossley could begrudge them. It stands without reason that the fatigue of having to play five games in ten days had taken some toll on Mossley but it can't fully excuse what was, all told, a poor performance in which ideas were sorely lacking. And just to show that I'm not completely self-unaware, it's something that can equally be applied to this match report too. There's no way I can get nearly a thousand words out of it like the previously mentioned report on the Magpies forum (for which the writer deserves a medal) which is why I'm finishing it... now!